Whooee…really big week, this one is. Probably because it’s one of the first weeks of the new year, and Valve has returned from their end-of-the-year vacation ready to go fix some bugs. The same time Valve also fixed another Well exploit where Soldiers, Demomen and Engineers could reach the roof in the final capture (or flag) room, opening up some extremely good sentry/airbombing positions with no real counter. Exactly two years later on January 7th, 2010 Valve released a patch that fixed the best part of the Force-a-Nature; Shooting someone while above them dealt falling damage equal to the FaN’s knockback, even if the target was grounded. The FaN has never recovered from this crippling nerf. One week later Valve rolled out a huge bug-fixing update, you can read all the changes here. Highlights include the Ubersaw’s new killtaunt, the Dead Ringer obeying many new rules of ragdolls, and a bunch of soldier unlock nerfs. 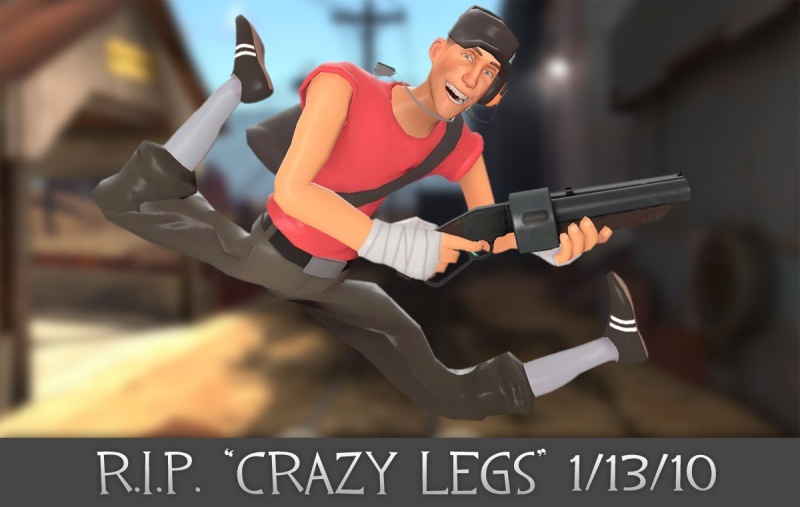 They also removed Jelly Legs scout, though that particular bug has a nasty habit of not staying dead. This picture regardless, I’m still seeing this visual bug to this day. On January 7, 2011 they fixed the Powerjack giving you health back if you were holding it while an enemy died of afterburn…and then instantly switched it back three days later. The bug would finally get fixed permanently in March. January 11th made many competitive players sad by putting a limit to the FOV range you could set. No more playing TF2 as if the mercs had compound eyes. In the now-extinct TF2 Beta, Valve increased everyone’s health by 25% just to see what would happen. This was after a much more hilarious event where everyone’s health was doubled. I truly feel for everyone who didn’t get to experience that day. January 8, 2013 saw a number of fixes to the new game mode Mann Vs. Machine. In particular, a bunch of tournament settings were removed. In normal play, tournament settings disable timers, flag pickup, and control point capturing until the admin starts what is presumably a TF2 tournament. In MvM, this made the bots unable to pickup the bomb, for a guaranteed human victory if they could kill all the tanks. Also fixed were a number of ways players could score assists with themselves; the only one that survived this patch involves a sniper jarate’ing an enemy who then dies from Tribalman’s Shiv bleed. January 9, 2014 saw a nerf to the Short Circuit from the recently-buffed and now hilarious projectile devourer. This update increased the metal cost and decreased the firing speed, meaning it could no longer solo the Valve Rocket Launcher like the old one.